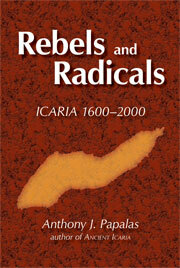 Anthony J. Papalas has assembled a true "peoples" history by bringing together unusual documents such as dowry agreements and Ottoman court records, memoirs, and accounts of Icaria by people who were involved in the events he describes, all interwoven with informative and perceptive descriptions from forty years of interviews with Icarians from all areas and conditions. Here is a history on the social level, not grand politics or great battles, but rather the everyday existence and immediate choices which, once made, shape succeeding events. The entire cultural, social, political and religious development comes alive—from the prehistoric times of the temple of the xenophobic Artemis who demanded human sacrifice of strangers to modern times when an airfield was built on the island fulfilling the legendary ambition of Icarus to fly. The author, versatile in the Icarian dialect which he learned from his immigrant parents, uses hundreds of personal interviews over the past forty-five years to bring a unique collaborative evidence to his other sources, mostly unpublished, such as letters, diaries, court and church records, land sales and contracts. Equipped with the insights of a native, the objectivity of an outsider, the training of a classicist and the willingness to seek material throughout North America, Western Europe and Greece, Professor Papalas has produced a unique work of scholarship. The revealing details and the intimate understanding of the various forces at play are possible only because Papalas has empathy, sympathy and on occasion censure for the key decisions Icarians made in the last four hundred years.